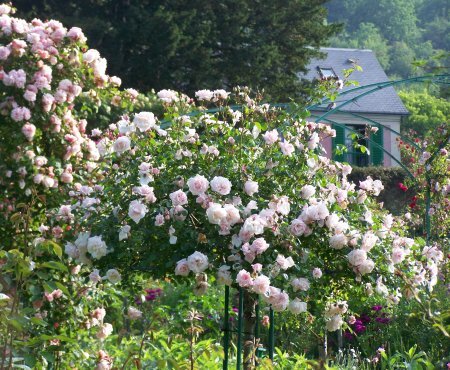 Every day from March 22, 2019 to November 1, 2019 we are at your disposal to guide you in Claude Monet's wonderful gardens at Giverny and to unveil for you the charm of his home. Our meeting point is the Group Entrance. By appointment only, time at your convenience. Tickets are not included. They can be purchased on line or be provided by your guide if required. Guiding fees : 190 euros for the group. This rate does not include admission tickets. 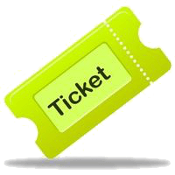 They can be purchased at the Group Entrance: + 8 euros/person. Tour Duration: 1 hour 15 to 1 hour 45. The group will need some additional free time to visit Monet's house and enjoy the site. Groups over 25 people will have to be divided. Count 1 guide for 25 people maxi. Because of the small rooms it is not possible to guide inside Monet's home. Explanations will be given outside, then you will visit the house on your own. 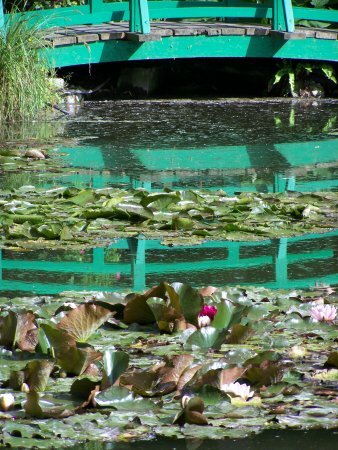 During our visit of Fondation Monet at Giverny, you will realize why these places inspired the master of Impressionism. You will cross the famous Japanese bridge and stroll around the waterlily pond to observe the ever changing reflections on the water surface. Then you will get back to the Clos normand, the gorgeous flower garden blooming from spring to fall. You will learn how Monet himself designed it by applying his skills for painting to gardening. The house looks exactly as it did on Monet's times, with the studio-sitting-room, Monet's and Alice's bedrooms, the yellow dining-room with its suprising collection of Japanese woodblocks and the kitchen decorated with blue tiles. Your guide will tell you about the way Monet transformed it to his own style. Thanks to many details about Monet's family life in this very place you will take a leap backwards to the 19th Century. 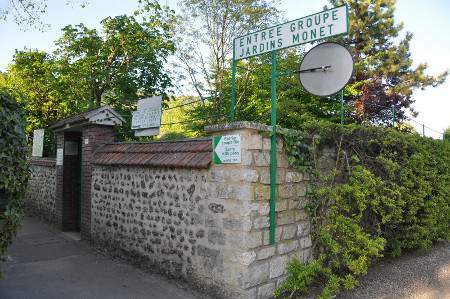 All the appointments are at the Group Entrance which is located in a lane (sente Leroy) at the bottom of the gardens near the road D5 (chemin du Roy). You will be asked for a guarantee when you book your guided tour. Should you cancel 30 days or more before the tour, your deposit will be refunded except for banking fees. No refund in case of cancellation less than 30 days before the tour. 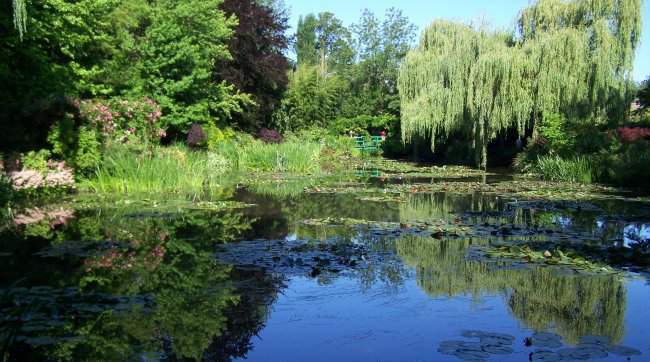 Monet's Gardens are wheelchair accessible. But the house has many steps. Fondation Monet has a few wheelchairs but it is better to come with your own. After the guided tour you will have time to take advantage of the gardens as you like untill closing time. It is recommended to take pictures and videos at your leisure before or after the guided tour. The tour takes place in any weather. Take an umbrella, a bottle of water and wear warm clothes if necessary (it may be chilly on the waterside), and comfy shoes. Museum of Impressionism Giverny: only steps away from Monet's gardens, the museum displays exhibitions on the pictorial movement founded by Monet. Vernon: located 5 km from Giverny, Vernon offers charming narrow streets lined by half-timbered houses, a beautiful gothic collegiate church and outstanding impressionist paintings in its museum. Chateau-Gaillard and Les Andelys: 25km from Giverny, in a beautiful setting, the ruins of the castle built by Richard the Lionheart overlook a loop of the Seine River. The church of Grand Andely is famous for its 16th century stained glass windows. Ariane Cauderlier is a free-lance professional guide-lecturer. She is licensed for English, German and French. 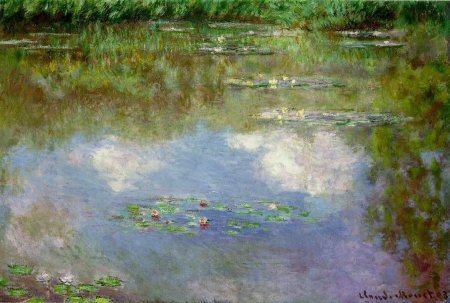 A former journalist, Ariane became a guide because of her passion for Claude Monet. She specializes in Giverny where she comes daily, living nearby. She likes to share her enthusiasm for Monet's gardens! If you are a keen gardener, tell her and she will tailor your tour to match your interest. Ariane still loves writing and taking pictures. 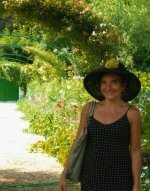 Follow her on her blogs: Giverny News in French, Giverny Impression in English. Ariane is the author of a book of commented pictures on Vernon and Giverny, and of a perpetual calendar Giverny 365 Photos. Keen on developping Monet's and Giverny's image, Ariane founded the Association GiVerNet. She is the editor of several websites devoted to Monet, especially giverny.org and intermonet.com.
" I was blown away by the masterpiece created here by Monet. Our guide, Ariane could not have been more charming. She floats through the garden imparting knowledge as she goes. It's obvious she loves this place and finds interest there each day, you can't help but to be drawn in. Patricia Rynski d'Argence is a free-lance professional guide-lecturer. She is licensed for English, German and French. From Giverny to Honfleur, Patricia knows the Seine valley inside out. In addition to her job as a guide, Patricia is a keen painter. 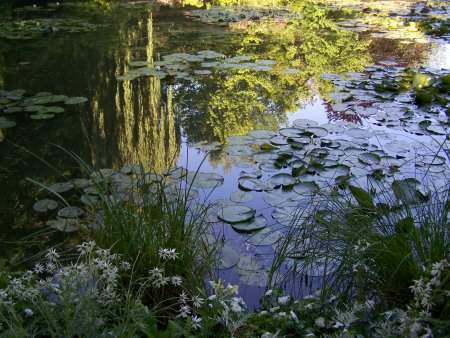 She lives close to Giverny, an inexhaustible source of inspiration! Patricia gives watercolor lessons and talks about the Impressionists. She will be too happy to guide you through Giverny, Vernon, Chateau-Gaillard, Les Andelys, Rouen, Vascoeuil, Caudebec en Caux, Lyons la Forêt, the Norman abbeys, at Victor Hugo's place in Villequier or on Channel side at Honfleur, Etretat and Fecamp. How will we recognize one another? Our meeting place is the Group Entrance of Fondation Monet. Kindly tell the guard that you have an appointment with Ariane/Patricia. Your guide will come towards you at her arrival. Where is the Group Entrance of Fondation Monet located? The Group Entrance of Fondation Monet is situated in a lane called ruelle Leroy. This lane slopes up on the left side of the garden when you are on the road D5 (Chemin du Roy). Walking from the parking lots next to the round-about, follow signs entrée Groupe / entrée coupe-file. Warning : you can't be dropped at the Group Entrance. Stopping with a vehicle is forbidden. The driver can drop you at the Entrance for individuals (materialized with French flags). Walk along Monet's house to the right and walk down ruelle Leroy to the Group Entrance. How will the tour go? We'll start by the water garden, where Monet painted his famous Nympheas. We'll walk around the pond and stop by the Japanese bridge. 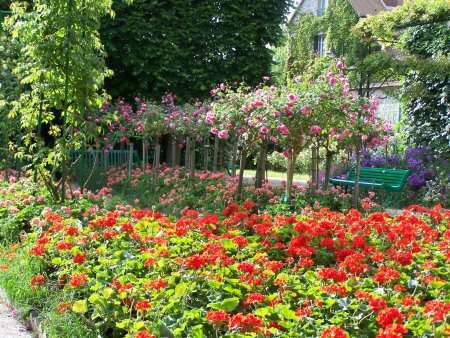 Then we'll come back to the flower garden that we'll cross gently to end the tour in front of Monet's house. Along the tour we'll stop often for commentaries or simply to admire. On average an hour and fifteen minutes to one hour and forty-five minutes depending on crowds. Is Monet's house included in the guided tour? As the rooms are small, it is not allowed to guide inside Monet's house. Your guide will talk about it in front of the facade, and it will be the end of your tour with her. Then you will go on your own to see the inside. Is the guided tour appropriate for gentle walkers ? Yes, the rhythm is slow and it is possible to sit down from time to time. Fondation Monet has a couple of wheelchairs possibly for lent. It doesn't fall into the guide's remit to operate the wheelchair. Is the guided tour adapted to children? In case of a family tour, the commentary takes into account the age of the children. Their pleasure at the tour will be even greater if it has been prepared (books or videos, paintings...). Recommended age : from 6 on. Children are under the responsibility of their parents who will see to it that they keep calm during the tour and respect the premises and the other visitors. (no stepping on the flower beds or lawns, no running, etc). Can I stay in the garden after the tour? Yes, you can enjoy Monet's house and gardens until closing time (6.00pm) if you like. But it is not allowed to exit and re-enter later the same day, for instance to go for some lunch. In this case you would have to pay for your admission again. Can I have a picnic in the gardens? No, picnics are not allowed : it's a museum. There are lots of nice picnic places in the surroundings, some of them with tables and benches along the river Seine or Epte. Giverny has also several restaurants for a fast meal, a traditional menu or a gourmet treat. Are pictures allowed during the tour ? Pictures are not forbidden, but Monet's gardens are so beautiful that you will probably want to take many shots. It is better to make them quietly before or after the tour to take advantage of your guided tour. In accordance with copyright law, it is forbidden to record the lecture. This is why you are kindly requested not to use any kind of video recorder during the tour. Please also refrain from taking a picture of your guide. Are bathrooms available during the tour ? The toilets of Fondation Monet are located next to the exit, therefore they won't be on our way during the tour. Free public toilets are available in the parking lot Le Verger in front of the tourist office. What happens if it rains the day of the tour? The tour still takes place, unless it could be dangerous (severe orange or red weather warning by Meteo France). Monet's gardens are very enjoyable to stroll around when it is drizzling, the light is beautiful and it is less crowded. You will need waterproof clothes and an umbrella per person. Should the tour be cancelled because of dangerous weather, we would try to re-schedule it. If it is not possible, the guarantee will be refunded. Please call your guide as soon as you realize you are running late. Maybe we'll be able to postpone the tour later the same day. 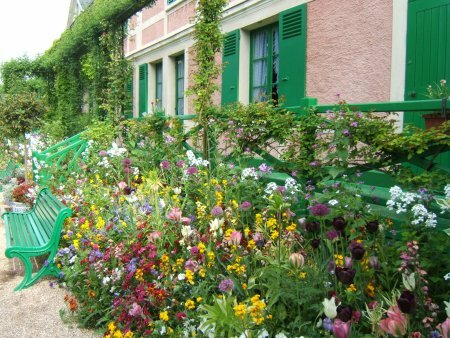 To travel from Paris, count two hours at least to get out of the city and drive the 50 miles to Giverny. From the exit 16 on the highway A13, it is still 20 minutes to Giverny. It is wise to have plenty of time, you will appreciate not to be in a hurry and having time for a rest before the tour. If you get to Giverny real early, you can explore the lovely village of Giverny, the museum of impressionisms and its garden, and the church were Monet is buried. In high season, your guide will probably give several tours a day. If you are late and it is not possible to continue after time or postpone the tour, it will have to be shorter. However, without any news from you, your guide is not supposed to wait for your for more than 30 minutes. In this case, the full amount of the tour will be charged. In which language is the guided tour? In English unless you request a French or German or Spanish guided tour. The tour is not bilingual. A privately guided tour for your family or your group up to 25 people costs 190 euros. Admission tickets are not included. Your guide can provide them, or if you prefer you can buy them online, and thus be able to enter the gardens before the tour. The deposit can be paid by transfer or by paypal. For the balance we're sorry we can't handle credit cards. The balance can be paid in cash in euros the day of the tour. We also accept checks in euros on French banks. Cancellation is free of charge up to 30 days before the tour. Your deposit will be refunded except for banking fees. If you must cancel the tour less than a month before the date of the tour, the deposit will not be refunded. In case of a no-show, the full amount is charged. We may relax these conditions in case of absolute necessity (transportation strike, riot, hurricane...). If your guide is sick and can't find a substitute colleague and can't postpone the tour, the deposit will be refunded. Please provide a cell phone number where to call you in case of necessity. Dogs are not allowed in Fondation Claude Monet except for guide-dogs. By Boat: River cruises are more and more popular.